Suspended Brands is a leader in recreational and medical cannabis. Its 20,000 square feet of greenhouse production encompasses two micro-controlled greenhouses, where some of the most innovative cannabis in Washington State is bred and grown. A standalone processing facility houses extraction by method of CO2, along with a commercial kitchen which produces infused bites. This June, the Greenside Recreational team had the opportunity to tour this remarkable Tier 3 producer’s operation in Belfair, Washington. Flower in both the vegetation and flowering stage looked happy and healthy, and it’s apparent this facility differentiates itself with its cutting edge procedures. Notably, Suspended Brands embraces sustainability by utilizing well water, sunlight, automated light deprivation and organic nutrients. When the Greenside team got a chance to view the drying cannabis, the aroma was pungent perfection. The extraction and refinement machines in the processing facility were otherworldly. With the clean lines and chrome, this part of the expansive compound could easily be mistaken for a biotech lab. Fortunately, Greenside’s visitors were able to view the distillation process first hand, and watch as golden matter passed through different elements of an elaborate metal and glass unit, before inspecting the clear concentrates the refining process created. Overall, a day of learning is a day well spent, and Greenside’s tour at the Suspended Brands facility was chock-full of educational experiences. 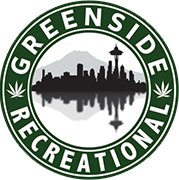 If you want to buy a product grown and processed by a cannabis company whose pride is innovation and sustainable practices, pick up one of their products at Greenside Recreational. Some of their strain offerings include Friesland, Kraken and Maui Wowie. To see if this brand is available today, check the Seattle and Des Moines menus. Previous It’s Time for the Bite of Seattle! Next Back in Stock: Greenside Apparel!